Our first cruise was years ago out of Charleston, SC on the Carnival Fantasy. We had absolutely no idea on what to expect or how to embark. To be safe, we stayed at a motel in the area that had a shuttle to the port since I had no idea on where we’d park when we got there. I was a newbie at one time also, with all of the same questions that you have. I still remember the shuttle driver telling us that there would soon be a new port terminal in Charleston, we’re still waiting for that. I remember being totally unimpressed with the cruise terminal since it seemed to be an old warehouse, and it did not seem to be very organized. The line was very long to check in, and then again to check out with Customs. Embarkation did not go smoothly. But the minute we were on that ship, we were awed and we forgot everything about our disorganized port terminal experience. It was wonderful. Our second cruise was out of Port Canaveral, and oh, what a difference! Everything was very organized and efficient, the lines were short, and we were on the ship in no time. That being said…some of your cruise terminal experience will be different than mine, depending on where you cruise out of and the terminal your ship is docked at. We were at the oldest terminal in Port Everglades in Fort Lauderdale and it was extremely unorganized, but some of the terminals there are newer and more organized. First thing that you need to deal with on embarkation day is getting to the terminal and parking. There are a few different parking options at most terminals. We normally cruise out of South Carolina or Florida, so I can’t speak for other ports, but most are similar to this. We drive to our cruise, and parking options are normally to either park at the cruise port, which will be the easiest and most convenient but also the most expensive option; park at a private parking lot near the port and take a shuttle to the terminal, which is normally much less expensive than the cruise port, or stay at a motel with a Snooze, Park and Cruise package. That means that you spend the night at the motel, leave your car there during the cruise, and they shuttle you to the cruise port, and sometimes back. I know in Miami we had the shuttle to the cruise port from the motel, but we had to pay $20 extra for a shuttle to bring us back to the motel to our car, but in Port Canaveral, the shuttle was included both to and from the port, so read the fine print when you book. This option can cost more or less than getting a motel and parking at a private lot, so do your homework and compare prices. If you fly in you can usually get a shuttle to either the port or to a motel, then from the motel to the port, or you can use an Uber cab. Once again, do your homework ahead of time and compare prices. We always get to the port early because we don’t want to waste a minute on the ship. We would normally get to the port by 10 am, and then around 11:00 am – 11:30 am, depending on when your ship is going to sail and if they got the last passengers off the ship, you can get onboard. Once you get to the terminal you will give your check in luggage to the porter and he will get them to the ship for you. It is customary to tip your porter a dollar or two for each bag. The luggage is then loaded onto huge metal containers, and loaded onto the ship. You won’t get them back till later in the day. We’ve gotten ours back as late as 6:30 pm, so make sure that anything important, like medications, are packed in your carry-on bag. You may also want to pack a toothbrush and toothpaste in case your luggage doesn’t come to your room till after dinner. And luggage has known to get lost, so I like to have trip insurance to cover lost luggage in case I have to replace anything. Luckily, we’ve never lost anything but since Trip Insurance covers other things, like medical and a missed cruise, I like the security of having it. Okay, how do you check in? First of all: Make sure that you have your printed out cruise documents and passport or birth certificate with you, don’t put them in your check on luggage! They will not be able to find your luggage to retrieve your documents and you will need them to check in. Once you get to the door of the terminal, your documentation will be checked, and then you will be shown which line you need to get in so you can check in. I guess that the best way to explain it would be to think of a bank teller line in a bank, with lines roped off and lots more people in line than a bank and way more tellers, thankfully. Some terminals have electronic signs at the top of each station telling you which teller is available, and some terminals that are not as advanced have people holding paddles with numbers on them to guide you. Either way works and you will be guided to the correct opening when it is available. Once you get to the front of the line and are directed to a clerk, she will ask for your printed out cruise documents, and your passport or birth certificate and photo ID, whichever you are sailing with. These directions apply to US ports, please do your research if you are sailing out of or into another country. If you are on a closed loop cruise, which means a cruise that starts and ends at the same US cruise port, you are not required to have a passport. However, you will need proof of citizenship such as an original or certified birth certificate, a certificate of naturalization, a passport card, or an enhanced driver’s license. You also need a government-issued photo ID. Children also need proof of citizenship. If they are over 16 they also need a photo ID. It is suggested to bring a passport. If something happened and you missed your ship at a port, you’d need it to fly back home. If you are traveling with a child that is not your own, or if the other parent is not traveling with you, you will want to bring a notarized letter from the parent(s) giving approval for you to bring the child on the cruise. If you are a newlywed woman, either book the cruise in your maiden name, or bring documentation of your name change, or you may not be allowed onto the ship. After the clerk checks on your documentation, she will take your picture. This picture is linked with your sailing card. Every time the ship crew swipes your card, they will be able to see your picture on their screen to verify that it is indeed you that is entering or leaving the ship. This prevents someone else from being able to use your card. Then they will give you your sailing card. Your sailing card should contain the location of your dining room, the last 3 numbers of your cabin (the first number is the deck number that you’re on) and your muster location. It is used to get on and off of the ship, to get into your cabin, and for any purchases that you make on the ship. You are usually also given a boarding number. After that, if you are early, you will be directed to a seating area to wait for embarkation. If you come into the terminal after the ship has already started the boarding process, you will be directed to the line to board the ship. Do not be late, the ship WILL sail without you. Once the ship is ready to board they will usually announce it on the loudspeaker. Some terminals also have TV’s with the information. Usually the first people to board the ship would be those with a handicap. After that will be those on the highest levels of the VIP program (VIFP (Very Important Fun Person Club), Faster to the Fun, Crown and Anchor Club, etc. ), and then after the high levels board, they will start calling the boarding numbers, starting with number one. (The only port that we’ve been to that did not do this was Port Everglades Terminal 29, and there it was pretty much a free for all. Not fun.) They will check your number as you line up to board. You will then pass through an area of photographers taking your embarkation photos for the ship. You do not have to have your picture taken if you don’t want to. Just walk past the photographers. Then usually you will go up an escalator, down a hall, and onto the gangway and then into the ship. The crew at the door will scan your sailing card to be sure it’s you, and then you’ll either walk into the atrium area of the ship, or onto the muster deck and then into the ship. It’s time to enjoy your cruise! It’s always exciting to step onto a ship. Debarkation: And then before you know it and way too fast it’s the last evening before your cruise ends…what do you do now? You should have received luggage tags from your room steward with a number on them. The lower numbers get to leave the ship earliest. If you have a high number, it’s going to be later before you can get off of the ship the next morning. A little secret…if you want to get off of the ship earlier but have a high number, go down to the customer service desk that last evening and request a lower number. They are very accommodating. Or, if you want to get off really early, you can self-disembark. Be aware though that self-disembarking means that you will have to take all of your own luggage off of the ship by yourself. That is not always easy, especially if you have a lot of luggage or it’s heavy. If you decide that you want the ship crew to take your luggage off the ship for you, place the numbered luggage tags on the handle of your luggage and put them in the hallway outside your room by the time that the ship instructs you to. Usually 11 pm. Make sure that you keep clothing and anything else you’ll need that night and the next morning in your room. Okay, get up early that last morning. It’s always a sad day for me. We get dressed quickly and then run to the buffet to get a last breakfast and say goodbye to the waiters we’ve met. If I’ve really gotten to know them I’ll give them a tip. Then we come back to the room and finish packing our carry-on and make sure that we haven’t left anything in the safe or the room. I like to leave an extra tip for our room steward if he’s been helpful. Then it’s time to head to the waiting area that we’ve been assigned. Like I said before, we always ask for a lower number so we can leave earlier. We always have a long drive ahead of us. Once they call our number we head to the exit of the ship for one last swipe of our sailing card. This is how they can tell if everyone has left the ship. Then onto the gangplank again, and out into the terminal. Once you go down the escalator or elevator you’ll view a sea of luggage in front of you. Your luggage will be in the same numbered area as the number you had when you exited the ship. You’ll have to go in and try and find yours. I suggest that you put a ribbon or something identifiable on your luggage tag before you cruise to make yours stand out because there will be a lot of luggage that looks the same and you will have to find your own. 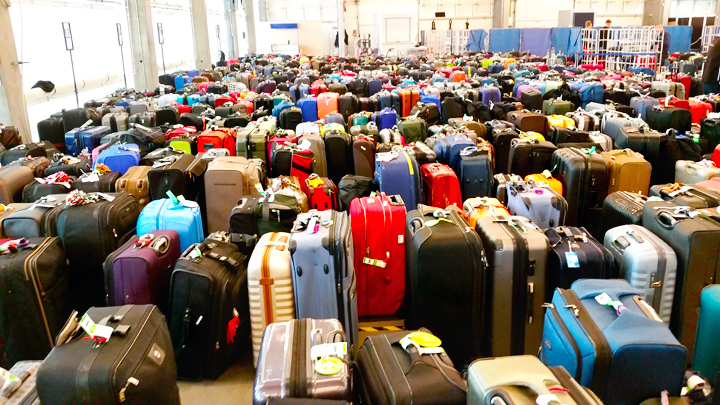 After you find your luggage, you will get into the Customs line and wait for your turn. Once you get to the front of the line, a port employee will guide you on which Customs Agent to see. We’ve never had any problem with getting through Customs. The Agent will ask you a few questions but you don’t have to fill out the US Customs form anymore, at least here in the US. See here for duty free allowances (in the US). Then he will wave you through the line if all is well and you’ll leave the terminal. Then, if you parked at the port, you go and hop into your car and head for home. If you took a shuttle from a motel or parking lot, the port workers can guide you on where to wait for the next shuttle. The same with an airport shuttle. Time to head towards home so that you can plan your next cruise! This entry was posted in cruising and tagged addicted to cruising, Caribbean, cruise blog, cruise port, cruiseblog, cruising, debarkating, debarkation, dolphin, Embarkation, embarking, hsp, introvert, quietcruiser, royalcaribbean, ship on June 28, 2018 by The Quiet Cruiser.